Anime series, CGI movie, mobile mini-game to be available in lead-up to main game's launch. After 10 years of waiting, Final Fantasy fans finally get a confirmed worldwide release date for the much-awaited Final Fantasy XV: September 30. The date was revealed during Square-Enix‘s Uncovered: Final Fantasy XV event held last March 31 in Los Angeles, California. You can watch the entire event here. Aside from the launch date, there were other products unveiled during the event that gamers can sink their teeth into while waiting for the release of Final Fantasy XV. This includes the Platinum Demo: Final Fantasy XV, a free demo game made available for PlayStation 4 and Xbox One during the event. The game features a young Noctis in a dreamscape world accompanied by one of the franchise’s beloved creatures, Carbuncle. Platinum Demo aims to gives gamers a glimpse of the main game’s features like the intricately designed worlds, realistic day-and-night transitions, weather effects and the battle system. A five-episode anime series, Brotherhood: Final Fantasy XV, was also announced during the event. The series, which will be released for free on YouTube in the months leading up to the game’s launch, features the backstory of the four main characters of the game. You can watch the first episode with English subtitles here. Another surprise revelation was Kingsglaive: Final Fantasy XV, a full-length CGI feature film which will be released straight-to-digital sometime before the main game’s release. It features the voices of popular actors Lena Heady and Sean Bean of Game of Thrones fame, and Aaron Paul (Breaking Bad). The movie’s story will run parallel to that of the game as it focuses on the events surrounding Noctis’s father King Regis and childhood friend Luna after Noctis escapes on a road trip with his friends. For the first time in the history of the Final Fantasy franchise, a mini-game will be released prior to the actual game it is featured in. Justice Monsters Five is a pinball-like mobile game, shown in Final Fantasy XV as an arcade game, featuring miniaturized versions of the monsters and summons found in the franchise. The minigame will be made available on iOS, Android and Windows 10 devices this year. Various editions of Final Fantasy XV are now available for preorder in the Square-Enix online store. The Day One Edition priced at US$59.99 (about ₱2,770) comes with a bonus Masamune weapon DLC. The Deluxe Edition priced at US$89.99 (about ₱4,160) includes the game disc along with other bonus DLCs and Kingsglaive: Final Fantasy XV movie in Blu-ray, encased in steelbook. 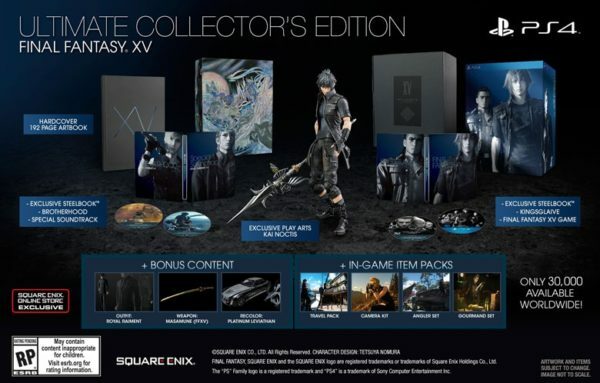 The Ultimate Collector’s Edition comes with all the Deluxe Edition content, plus the Brotherhood: Final Fantasy XV series in Blu-ray with an exclusive sixth episode; a Blu-ray soundtrack featuring music from the game, Kingsglaive and Brotherhood; a hardcover 192-page official artbook; four in-game item packs; and a PLAY ARTS -KAI- Noctis action figure with an exclusive weapon. He adds that they will “follow protocol to handle what appears to be unusual orders that may seem like they were made for resale purposes,” possibly referring to people selling their preorders of the Ultimate Collector’s Edition on eBay for more than triple the original price. Individual PLAY ARTS -KAI- action figures for Noctis, Prompto, Ignis and Gladiolus, as well as the Silver Pendant Ring of the Noctii, are also available for preorder in the Square-Enix online store. During the event’s pre-show, the game’s clothing designer Hiromu Takahara from the Japanese fashion house Roen announced that apparel based on the character designs of Noctis and Prompto will be made available worldwide on their online store right after the event. The full Noctis look costs ¥278,640 (about ₱117,020) while the Prompto look will set you back ¥362,772 (about ₱152,360). FINALLY… Square Enix set to release a remake of FINAL FANTASY VII!!! !